I was riding the bus when it hit me: familiar clamminess in my palms, twisting knot in my stomach, shortness of breath, rush of anxiety and a sense of dread. I was having a panic attack and it couldn’t have happened at a worse time. When I typically experience a panic attack, I take my anxiety meds and lie down until calm or asleep (sedation is an unfortunate side effect of my prescribed pharmaceuticals). But it’s my nephew’s birthday and, being his favorite uncle (I believe this is true regardless), I had to relax quickly and not miss his big day. So I turn to the Marley Natural CBD Rich cartridge I take to work, tucked discreetly in my pocket. I assume a brand named after reggae legend Bob Marley must produce quality cannabis products that respect the plant’s nourishing benefits, but celebrity endorsement can be a slippery slope. 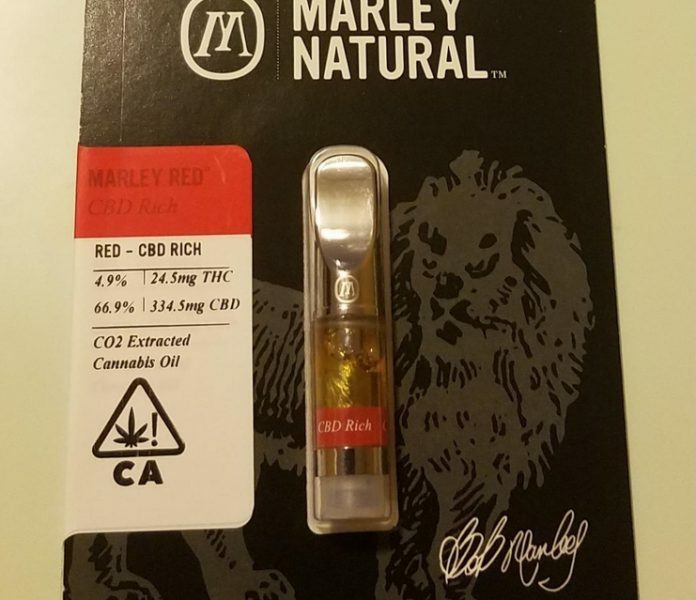 Will my first Marley Natural vape, their Marley Red CBD Rich cartridge, live up to its namesake’s standards? Let’s find out in this extensive review. I expected better packaging for such a high-quality cartridge. It comes in a thick cardboard panel and plastic blister pack, allowing you to see the CO2 extracted CBD vape oil inside. The front graphics are decent and limited: the “M” logo, brand name, a lion and Bob’s signature. The label offers basic info, but far less than I like. It lists compliant details like CBD:THC milligrams and percentages (334.5mg/66.9% and 24.5mg/4.9%) along with manufacturing, packaging and best-by dates. 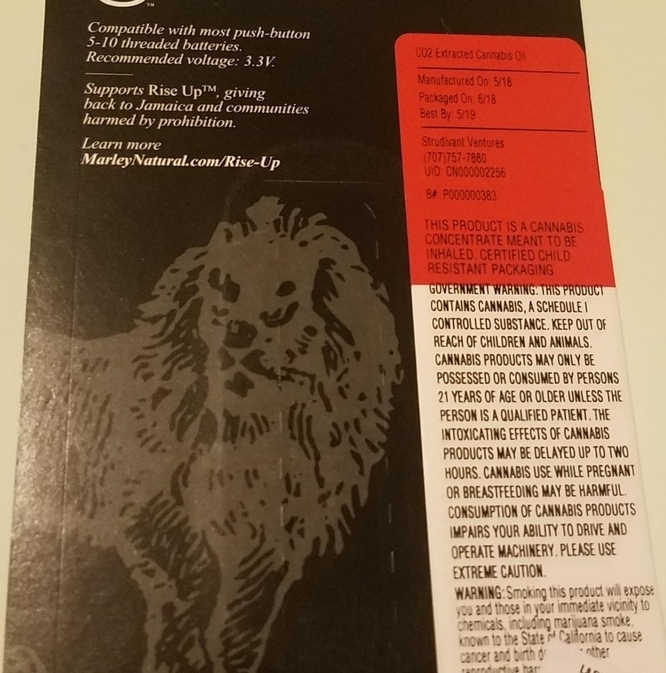 The back offers company info, health warnings, a note about their “Rise Up” charity, and the recommended battery voltage for Marley Natural cartridges. But, unfortunately, there are no lab test results listed on the packaging. I see a what I think is a batch number (B#) and the name of a subsidiary company, Sturdivant Ventures, and phone number. The Marley Red CBD oil looks beautiful. It appears to have an icy, crystalline texture and a rich, golden hue. I LOVE the way this tastes. It’s got that sweet and sour flavor indicative of CBD rich strains. (You’ll know what I’m talking about if you’ve dabbed CBD crystalline). In fact, it’s so tasty that it’s hard for me to stop. The vapor was so smooth, feeling completely comfortable on my lungs and throat. This cartridge offers the calming relief I need and it doesn’t make me feel stoned. I didn’t feel any psychoactive effects, but if you’re new to vaping I recommend trying it at home before using it out in the world just to see how you react. That being said, this vape helped relieve my anxiety and subsequent nausea without any negative side effects or a noticeable head-high. Hoping this wasn’t a fluke, I decided to try two more Red CBD Rich cartridges. They all had a consistent look, flavor, and fast-acting symptom relief. The oil’s thickness may vary somewhat per cartridge, but overall the brand makes a consistently reliable product. At about $45, it’s affordable for the quality and quick relief it delivers, even with the lack of extra protection or lab test results. CBD cartridges typically are more expensive, anywhere from $50 to $100 (dosist calm 200 dose). Plastic blister pack with a strong cardboard backing, but doesn’t offer the best protection. Nice, simple graphics: the Marley logo and a lion. Cartridge is clearly visible through the package, allowing you to see the oil so you know exactly what you’re getting. Labeling has mostly everything needed for compliance (CBD/THC percentages, manufactured on, packaged on, and best-by dates). No lab results; maybe the “b#” on the back has something to do with testing, but who knows?! Some company info, recommended battery voltage, and a bit about the charity they support. Glass tank with a comfortable metal mouthpiece that, unlike some, has the Marley “M” and lion engraved (not stickered). Cartridge remains clear and unclogged for as long as I puffed on it. 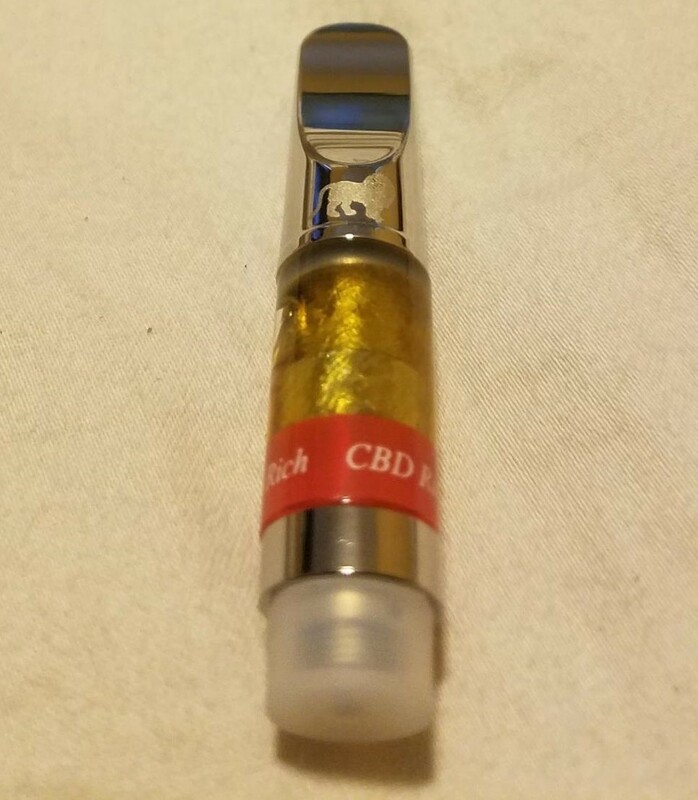 Mouthpiece is branded and the tank itself labeled with “CBD rich” so you won’t get it mixed up with your other cartridges. Delicious sweet and sour taste indicative of CBD rich strains. Never felt the need to cough with this cartridge. I keep using it and it continues to impress me. Oil is so thick, it looks like frozen jelly! It’s beautifully golden with some cloudiness, probably because of all of the cracks in the solid oil. The high-quality oil is evidenced by the impeccable taste and smooth vapor quality. Extremely effective with little use; very enjoyable with no negative side effects. Does a great job easing nausea, anxiety and inflammation without the psychoactivity. Cartridge can be used with most standard 510 threaded vape batteries. Small, discreet design with nothing fancy or game-changing. All Marley Natural cartridges have the same look, taste, pleasure and relief; difficult to tell them apart without the label on the cartridge. If you occasionally get a faulty cartridge, it’s probably because the packaging wasn’t so great at protecting it. Oil thickness can vary from cartridge to cartridge. Fantastic taste, pleasure, and medical relief for a moderate cost of $45. Would have been rated at a 5 if the packaging/labeling was a bit better, but if you just care about the cartridge/oil inside, this is an AMAZING price for the quality. From the first few minutes after my first pull, I got an explosion of that sweet and sour CBD flavor. I never felt the need to cough and relished the taste and calming effects of every smooth puff. I immediately felt my panic symptoms and nervous thoughts dissipate. When I got to my nephew’s party, I was feeling like myself again. And, despite the limited packaging and lack of lab testing, the reasonable price makes the Marley Natural CBD Rich my new go-to CBD cart. Go get this right now. The brand’s namesake would be proud.